EAGLEVILLE, PA, October 19, 2018 – Streamlight® Inc., a leading provider of high-performance lighting equipment, donated more than $700,000 over the past 10 years to the Breast Cancer Research Foundation® (BCRF), a not-for-profit organization seeking to prevent and cure breast cancer. 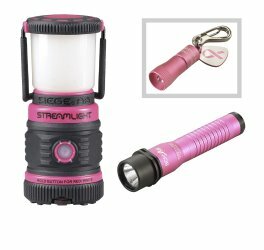 Each October, Streamlight recognizes Breast Cancer Awareness Month by highlighting its line of pink lights, the proceeds of which are contributed to BCRF. In 2018, Streamlight donated a total of $30,000 in sales proceeds to BCRF from the pink Nano Light® key chain light, the pink Siege® AA ultra-compact lantern, and the pink Strion® LED tactical light. For each of the lights, Streamlight donates $1.00, $2.00, and $5.00, respectively. Over the years, a number of Streamlight employees have been affected by breast cancer. Given the company’s tight-knit culture, the management team wanted to contribute to research efforts to find a cure. In 2008, they decided to create pink versions of several of its most popular flashlights and donate a portion of each sale to BCRF. In 2018, the American Cancer Society estimates that nearly 270,000 women will have been diagnosed with invasive breast cancer, and 41,000 will die from the disease. Men also are affected, with 2,550 men expected to be diagnosed, and 480 expected to die from the disease. The BCRF pink Nano Light, Siege AA, and Strion LED have MSRPs of $12.48, $52.44, and $196.52, respectively. All lights come with Streamlight’s Limited Lifetime Warranty. The Breast Cancer Research Foundation (BCRF) advances the world’s most promising research to eradicate breast cancer. Founded by Evelyn H. Lauder in 1993, BCRF has raised more than $500 million to fuel discoveries in tumor biology, genetics, prevention, treatment, survivorship and metastasis; making it one of the largest non-governmental funders of breast cancer research in the world. For more information about BCRF, visit www.bcrf.org. This entry was posted in Tactical Lighting and tagged BCRF, breast cancer, Streamlight. Bookmark the permalink.